Slice all the vegetables before start to cook the fish. 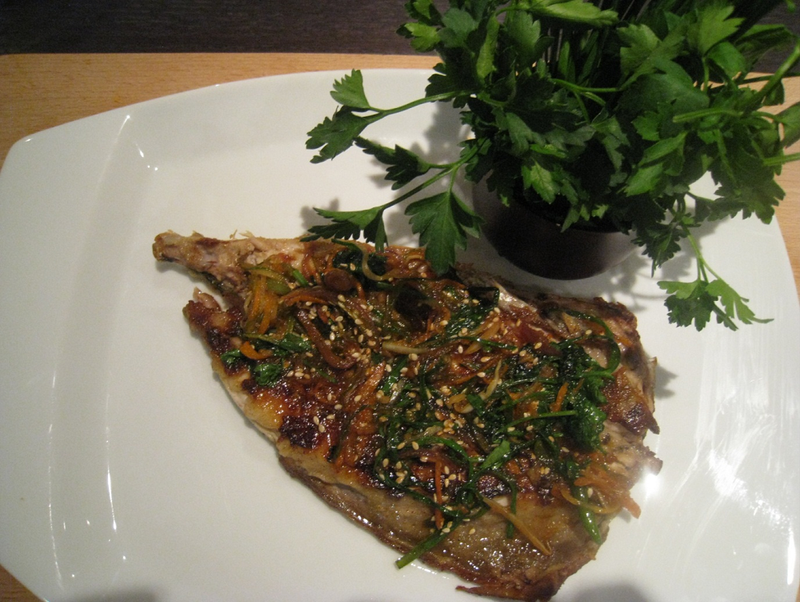 Place the mackerel on some flour with the exposed white side downwards and the skin upwards. Don’t use flour on the skin since it will char during cooking.Before putting the mackerel in the frying pan, shake off any excess flour. Pan fry for the mackerel on the skin side down first for 2-3 minutes turn over for a further 2-3 minutes until golden brown all over and cooked through. There are a lot of ways to cook potatoes; mashed, boiled, stuffed, baked, fried, roasted, grilled and salad. 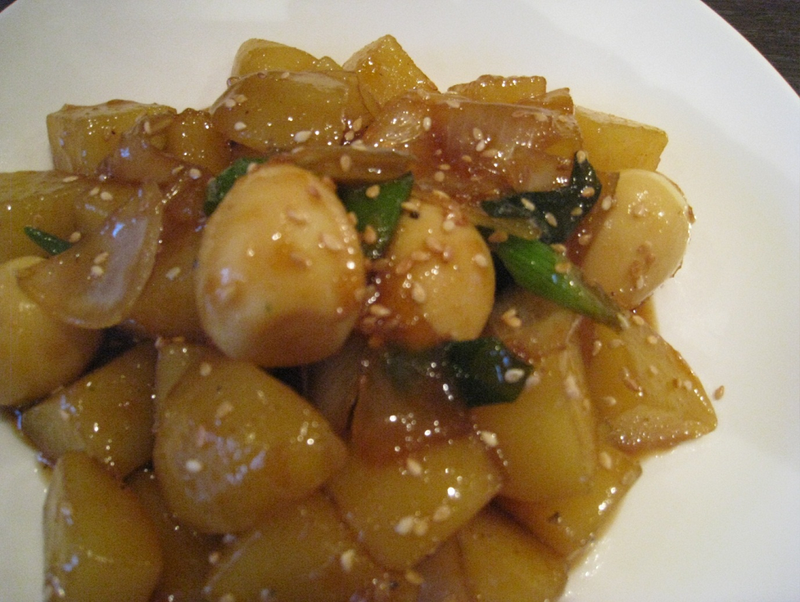 Here I want to add glazed potatoes in soy sauce to the list!Potatoes and onions are common combination in Korean vegetable dishes. This dish is so simple to prepare and needs few ingredients.“Gamja Jorim” will not only fill your hungry guests’ tummies but also be kind to your wallet too. Prepared properly this dish is very visually appetizing. This is very tasty so make only a small amount so that your guests will still be hungry enough to eat your next course. I think the chicken stock is very important. I used half a cube of “Knorr” brand chicken stock for this dish. You can buy dried anchovies from any Korean or oriental supermarket. Before using in this dish you will need to remove the anchovies’ heads, bones and intestines otherwise you may find their smell to pungent and their taste too bitter. This takes some patience but is not so bad for a small portion. Small sized dried anchovies are great for eating, you can sauté them with fresh chillies, garlic, some herbs and sesame oil or eat them as a snack with a glass of beer. For this dish I used some medium-small sized dried anchovies that my mother sent me about 6 months ago. Thankfully she had already removed their heads, tails, intestines and bones. Put the dried anchovies into a sieve and shake for a minute to free any powdery remains from the fishes. Give them a rinse under the cold tap a couple of times. Drain any excess water and then dry them once with some kitchen towels. Add the olive oil into the frying pan on a high medium heat. Add all the drained anchovies into the pan and stir fry them for 7-10 minutes stirring constantly. Remove all the fried anchovies and set them aside for a while in a bowl. We are going to add each of the ingredients sequentially in this order : sesame oil →freshly grated garlic→freshly grated ginger →sugar→gochojang→plum cooking juice→ golden syrup→ground black pepper → toasted sesame seeds. Stir each ingredient for 20 seconds on a high medium heat with wooden spoon before adding the next one to bring out the flavour of each ingredient. Turn the heat to low and add the previously fried anchovies into the sauce and mix well for 2 minutes on a medium heat. You can keep this dish fresh for over a week in your fridge. 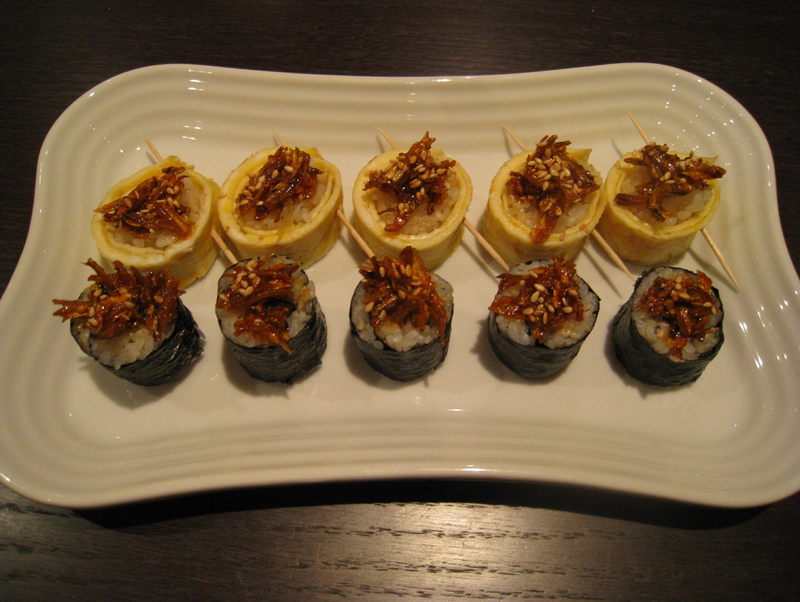 Here you can see different servings of these anchovies in chilli paste with egg and seaweed rice rolls all ready for a small party. This quick and easy, healthy pan fried Jerusalem artichoke pancake is bursting with fresh flavour. 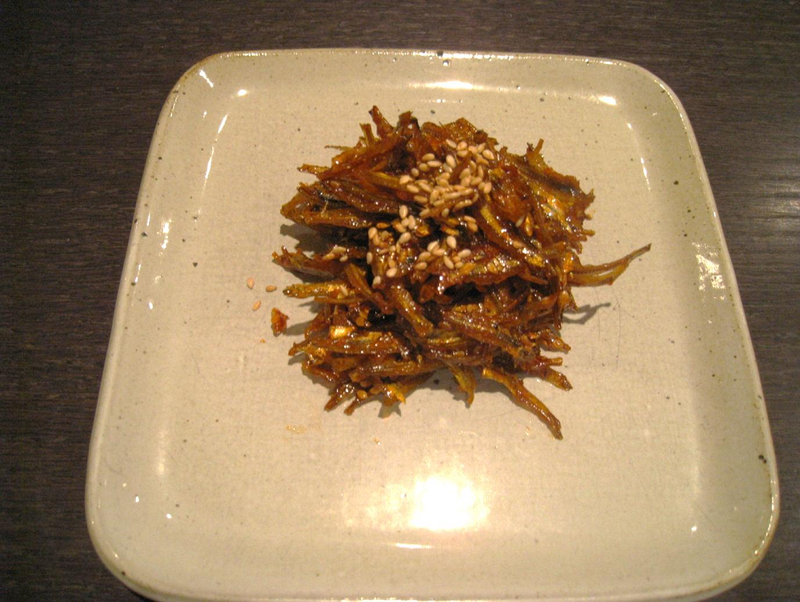 In Korea we use the vegetable called Toran but Jerusalem artichokes are a great alternative. Have you ever used Jerusalem artichokes as an ingredient?They smell like mushrooms and have the most amazingly crisp and earthy texture I have ever tasted so far in England. You can eat them raw, stir-fried, simmering in soy sauce or bake them in puff pastry. For the pancake batter, combine all the listed ingredients with the cold water, whisking thoroughly until you see no lumps. Mix with a spoon and set aside for a minimum of 1 hour. Chop all the vegetables and chicken into small pieces and place them on a plate. Add toasted the sesame seeds,sesame oil,soy sauce,sugar, ground white pepper, lemon juice, fresh Thai chilli and pinch of salt to the Chopped vegetables. Add all the mixed vegetables into the pancake batter and mix with a spoon. Keep the batter in the fridge a minimum of 1 hour (overnight if possible) before making the pacakes. Preheat a non-stick pan with a tablespoonful of olive oil on a low heat for a minute. Scoop a spoonful size of the mixture (use a small round shape) and spread it thinly in the pan. Fry on each side until the pancake becomes golden using between a low and medium heat. This should take around 5-10 minutes to do both sides. 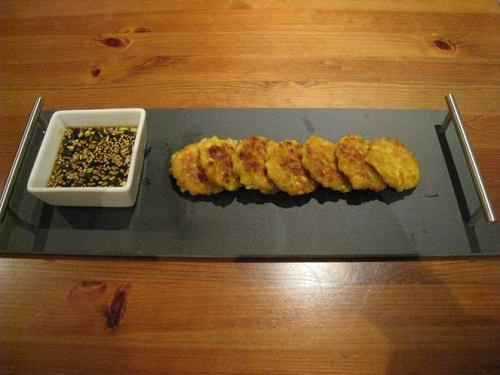 To serve, place the pancake onto a plate, optionally with a separate soy dipping sauce. For the sauce simply mix the ingredients indicated below, ideally do this the day before an leave to stand. Tip: If you can make this batter before a day and keep it in a fridge then the batter will settle nicely and smell and taste great. ¼ tsp, ground white pepper and a little bit of fresh chilli.